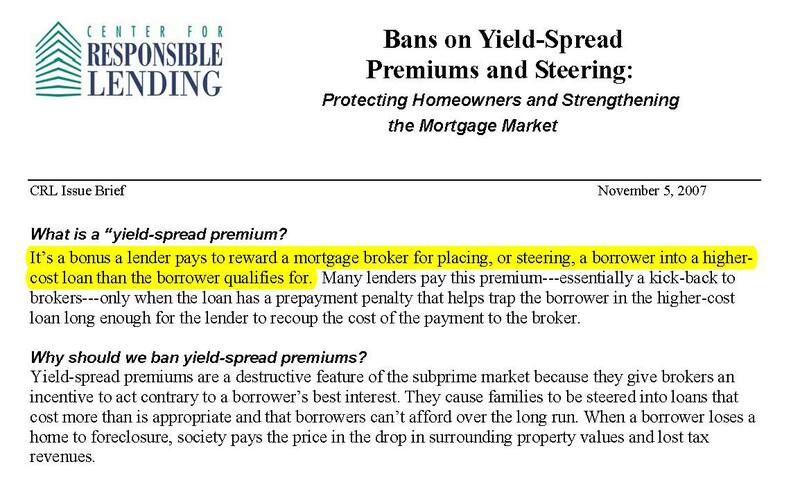 Please retract your Nov. 5, 2007 issue brief titled “Bans on Yield-Spread Premiums and Steering: Protecting Homeowners and Strengthening the Mortgage Market”. I am asking for your retraction because its definition of yield spread is false. Your request for a ban on yield spread lacks substance due its use of a false definition. I have asked the New York Times to withdraw its April 10, 2009 editorial “Predatory Brokers” and have alerted the editors that their false definition of yield spread is probably based upon the Nov. 5, 2007 issue brief from The Center for Responsible Lending. Let me start by defining yield spread and cost. My definitions will help you correct the false definitions which you have used. The payment is required by law to be disclosed to the borrower. The amount of the payment is determined by the size of the loan and the interest rate. The higher the interest rate, the higher the percentage which the mortgage broker receives as compensation. In the example I have provided to The New York Times, and which I include here, the mortgage broker charges yield spread equal to 3 percent of the loan amount by raising the interest rate from 4.875% to 5.4%. The lender pays the mortgage broker 3 percent of the loan amount based upon the spread or the difference between a loan which yields 4.875% and a loan which yields 5.4%. In this case the spread of .525% is the difference in yields between a mortgage loan of 5.4% and a mortgage loan of 4.875% (5.4-4.875=.525). The lender pays the fee to the mortgage broker because the loan at a higher rate is worth more. Almost all mortgage-broker transactions use yield-spread so that borrowers do not have to pay the cost of originating the loan. The right way to understand this is to call the 4.875% rate the “wholesale” rate the mortgage broker is charged for the loan and 5.4% the “retail” price the mortgage broker charges the consumer for the loan. A person who sells airplanes or computers or mortgages buys at a wholesale rate and sells at a retail rate. Uneducated persons who do not understand free markets and business or who hate free markets and business frequently voice opinions which fail to comprehend that business based upon sales always uses wholesale and retail prices. What is obvious to any fool is that mortgage brokers disclose more information than any sellers of a product or service. Think if you can of any other good or service which you purchase and which you know the price the seller pays. I can’t think of one. We do have one issue which undermines our disclosures in mortgage lending. The authors of the disclosure documents, various government agencies, have made it impossible to understand a mortgage loan. They have so flooded a mortgage transaction with paper work that disclosures are not very much different than the legal agreements you quickly click through when buying a service on the internet. Nobody reads them. They are too difficult to understand. And the latest version of the Good Faith Estimate, which went into effect January 1st, 2010, is so nonsensical that nobody knows the right way to fill them out. Forget about explaining them or whether they are accurate. I guarantee you the best job you could do for consumers is to make the paper work simple and easy to understand. It keeps getting harder and harder to understand and less and less relevant. Nobody reads it. Nobody understands it. There’s a real and serious problem in mortgage lending for you to tackle. Have you written yet on this issue? A borrower has only two choices for paying for his new mortgage. He can pay the expense himself or he can have the lender pay the expense. When the lender pays the expense, it is almost always done with yield spread. Cost: There are two reasonable definitions of cost. Definition (1) which follows is a subset of the more complete tally of “cost” defined in (2). Both are accurate definitions. the costs a borrower may pay including points, title insurance, appraisal fee, and lender fees. the total of costs a borrower may pay including points, title insurance, appraisal fee, lender fees and also the total of payments from the mortgage lender to the mortgage originator — the most important of which is yield-spread. These descriptions of cost and yield spread are accurate and factual. They will help you correct the errors of your Nov. 5 2007 issue brief. The rest of my letter will review the factual errors in your two-sentence definition “What is a yield-spread premium?” and in your three-sentence policy statement “Why should we ban yield-spread premiums?”. I am making this letter available to the New York Times so that they may better understand their own errors. 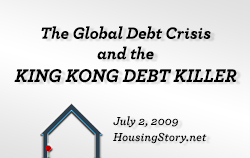 I have also posted on my blog on Feb. 11, 2010 the story titled “Predatory Incompetence Falsifies New York Times Editorial on Mortgage Brokers”. The posting is a request to The New York Times for a retraction and apology. If you have a comment for this posting or the “Predatory Incompetence” posting, I would be glad to print it. The “Predatory Incompetence” posting shows the interplay between the editorial writer’s false statements regarding yield spread and the definitions he very likely depended upon from The Center for Responsible Lending. If you have not printed a correction, I would like to print your correction or your statement reconfirming the validity of your previous work. Your document contains the following errors. I will list your statement, describe the error, and then advise on how the error may be corrected. My opinion is that the best mortgage loans depend upon yield spread. You may question that statement. You cannot question, unless you are printing falsehoods, that yield spread is paid on high-cost, medium-cost, low-cost and no-cost loans. Your definition says it is only paid on “higher-cost loans”. This is false. If your definition of yield spread was accurate, then I would agree with your policy prescription. Since it is not an accurate definition, it mischaracterizes the most fundamental aspect of mortgage lending as practiced by brokers. It is the equivalent of saying baseball is played with a basketball. In this case the terrible basic error which you committed allowed the New York Times to write an editorial titled “Predatory Brokers” that argued that baseball is played with a basketball. First, the statement characterizes the payment as a “kick-back to brokers”. If the payment from a lender to a broker is a kick-back, then it is a payment which is not disclosed. If you read the laws under RESPA, that is what it will tell you. Mortgage brokers must disclose yield spread. It is by definition not a kickback because it is disclosed. Calling it a kickback when it is openly disclosed is false. A kickback is an undisclosed payment. The reason that yield spread is not a kick-back is that lending laws require that it be disclosed. If the person who wrote this issue brief had attained the most basic understanding of mortgage lending, then they would know that there is a kickback paid in mortgage lending. The kickback is known as “release-spread premium”. It is paid when retail banks sell their loans. It is the exact same thing as yield spread premium except for one matter: IT IS NOT DISCLOSED TO THE BORROWER. 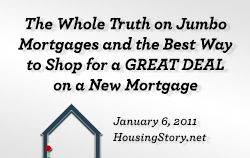 In other words, the more honest and open dealers in the mortgage industry are mortgage brokers. They disclose the income they will receive. And true to the old idiom that “no good deed goes unpunished”, The Center for Responsible Lending characterized the disclosure of origination income backwards. They condemned mortgage brokers who disclose their origination income as yield spread and you describe it as a kickback. False. Wrong. Only retail banks earn kickbacks and they don’t charge yield spread. So banning yield spread doesn’t end the practice of paying kickbacks. 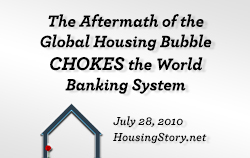 You have to ban release spread to end kickbacks in mortgage lending. In my search of your website, I find no documents with the term “release spread”. It naturally makes me wonder: Can The Center For Responsible Lending have no awareness of this basic issue in mortgage lending regarding release spread and yield spread? Is all of your research on the costs of loans comparing retail banks versus mortgage brokers invalid because you have ignored release-spread income? I wonder if you have ties to retail banks and if they pay your bills? Do you make your mistakes on purpose? If your research comparing the cost of mortgage-broker loans to retail-bank loans does not include “release spread”, then it is invalid and should be withdrawn in its entirety. All of it is wrong if you have skipped release spread. 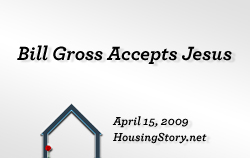 Your statement says: “Many lenders pay this premium (yield spread) only when the loan has a prepayment penalty that helps trap the borrower in the higher-cost loan.” Yield spread is paid on almost all transactions. Yield spread is paid whether or not the borrower accepts a prepayment penalty. Your definition falsely implies that a yield-spread payment is tied to a pre-payment penalty. It is not. Compensation for yield spread and compensation for a pre-payment penalty are entirely separate matters. Compensation paid for a pre-payment penalty IS NOT YIELD SPREAD. 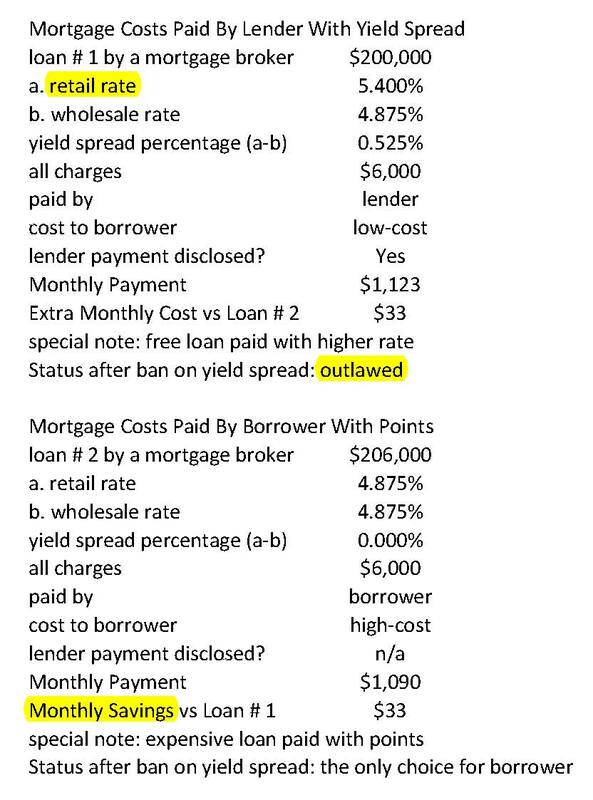 You say many lenders pay yield spread only when there is a pre-payment penalty. This is laughable and ridiculous. It’s flat wrong. It’s an error. It’s false. I would be surprised if one of 100 loans originated in the last two years have both yield spread and a pre-payment penalty. Unless you are talking about jumbo loans in which case the lenders I use charge prepayment penalties on all loans paid with yield spread. The most highly educated consumers with the highest incomes and the greatest financial acumen understand a prepayment penalty is a reasonable request for a bank to make after going through the tedious process of understanding the client to determine if they are qualified for a mortgage. The jumbo lender also want to guarantee they can recoup the yield spread they pay the mortgage broker. I’m sure you’re hip to that whole gig. Am I right? Yield spread premiums are a feature of prime, FHA, subprime, Alt-A, and all mortgage loans which I am aware of. 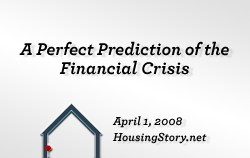 To characterize them as a feature of the subprime market is to imply they are not a feature of the rest of the mortgage market. They are. Your statement is false. The best research shows that yield spread is the smartest way for borrowers to borrow money when they take a out a mortgage (Please see “Do Borrowers Make Rational Choices On Points and Refinancing” By Yan Chang and Abdullah Yavas.). Press reports on this paper say that fewer than two of one hundred borrowers saves money by paying points. In other words, the kick-back option, the yield-spread option, is the option the leading academic researchers suggest for consumers in 98 of 100 mortgage transactions. Your falsehood is suggesting consumers take the more expensive option and yet you argue that your policy is designed to stop high-cost loans. The best loans, in my opinion, are paid for with yield spread. 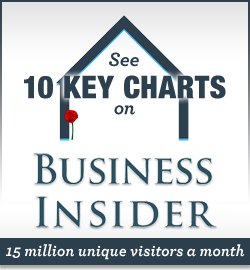 They are the most cost-effective way for borrowers to pay for their mortgage. Some of your own writing agrees with that conclusion. 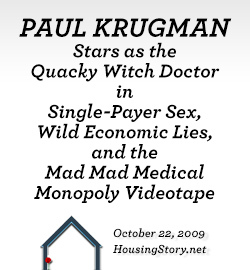 See, for example, Page 24 of The Center for Responsible Lending report titled “Unfair Lending: The Effect of Race and Ethnicity on the Price of Subprime Mortgages” (May 31, 2006) which states, in direct contradiction to the Nov 5 2007 issue brief, “We believe homeowners should retain the right to pay for home loans through a variety of mechanisms, including yield-spread premiums when they truly benefit borrowers.” How can you call for a ban on yield spread and argue that homeowners should retain the right to use yield spread? Your name is Alice and you live in Wonderland. If a broker wants to originate a predatory loan, that broker will take advantage of the borrower by charging high points and by charging high yield spread. It’s not yield spread or points which are bad. It‘s the broker who is bad. The first priority to police this is to require simple disclosures so the borrowers know what they are getting. The disclosures are a minefield of obfuscation and complexity and are the best friend of a dishonest broker. Educating the borrower is perhaps the critical matter. Every borrower should call two or three brokers to get a quote and compare prices. It isn’t rocket science. Appropriate regulation would also limit total compensation based on an equation which adds up yield spread, points, and other lender fees (normally called “processing” fees or “administration” fees) and caps the total amount which can be charged. I believe those limits are already in place, but I have no experience with it in my work because the limits are set beyond what I charge for loans. 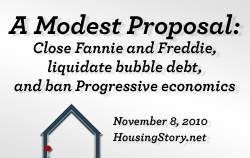 I have provided a detailed description of the falsehoods in your Nov. 5, 2007 issue brief titled “Bans on Yield-Spread Premiums and Steering: Protecting Homeowners and Strengthening the Mortgage Market”. 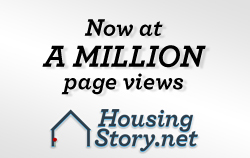 Please issue corrections or a retraction and send them to my attention at mike@mynewmortgage.com. Your work in this case is recklessly false. The New York Times trusted your statements and they have told the whole world a lie based upon your fictions. A group of senators has issued a letter supporting a ban on yield spread based upon The New York Times editorial. You have been influential, but you have purchased your influence with either ignorance or purposeful lies. Your currency has no value. Your credibility on mortgage issues is gone. Your issue brief on yield spread is nothing except errors. A Mortgage Broker Who Proudly Charges Lenders Yield Spread To Pay for His Clients’ Mortgages.